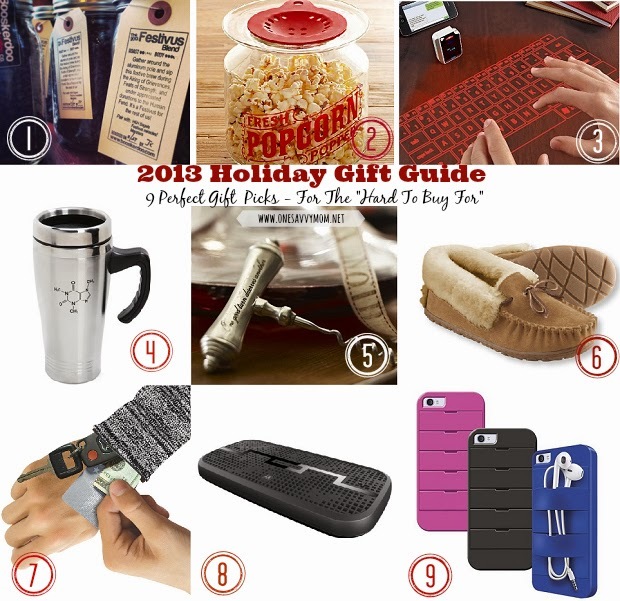 One Savvy Mom ™ | NYC Area Mom Blog: 2013 Holiday Gift Guide - 9 Perfect Picks For The "Hard To Buy For"
2013 Holiday Gift Guide - 9 Perfect Picks For The "Hard To Buy For"
We all have those "hard to buy for" individuals in our lives. If your still on the hunt for the perfect present to WOW the hard to buy for folks in your life this Holiday season, add a bow to any one of these item's and we think that they'll be thrilled! 1.Bookserdoo Fresh Roasted Coffee Co. "Festivus Blend" in 11.5 oz in ball jar ($12.99) - enjoy this delicious blend of Mexico Fair Trade Organic (light roasted) and Bali Blue Moon Organic (medium++ roasted). We all remember the hilarious "Festivus" episode from Seinfeld right? If your bucking the system this year and are tired of all the commercialism - escape with the perfect cup of Booserdoo Fresh roasted "Festivus Blend" coffee on "Festivus" (celebrated on December 23rd). The full flavor of this blend is absolutely incredible (perhaps one of the best cups of coffee I have EVER had). We also love that this fresh roasted coffee comes packaged in 11.5 oz Ball mason jars! Simply add a bow and it's ready to be gifted. 2. Microwave Glass Popcorn Popper from William - Sonoma ($22.50) - the perfect companion for family movie night! The Microwave glass popcorn popper offers up a healthy alternative to traditional microwave popcorn. Place a small tab of butter on the red top and it will melt the perfect amount of butter onto the popcorn as it pops. 3. Virtual Blutooth Keyboard by Brookstone ($99.99) You touch - it types! We have all experienced the nightmare of misspelled words / horrifying auto-correct issues with our cell phones! Avoid the embarrassment and save time with the Virtual Blutooth Keyboard by Brookstone. Because it is Blue tooth enabled, the laser projection keyboard pairs quickly and easily with tablets, smart phones and most laptops. 4.Caffeine Molecule Stainless Travel Mug from ThinkGeek ($9.99) Coffee enthusiasts will definitely appreciate sipping their morning java from ThinkGeek's Caffeine Molecule stainless travel mug! Gift it on it's own or pair it with a box of their favorite brand of K-cups or a gift card to their favorite coffee house. 6. L.L. Bean Men's & Women's Wicked Good® Moccasins ($69.99 - $79.99) - Super comfy, lined with Sherpa and constructed of genuine sheepskin - these Wicked Good Moccasins are as good as it gets and will keep your tootsies warm all Winter long! 7. Banjees™ Polyester/Spandex Reversible Polyester Wrist Wallet ($14.95) Soft fleece or polyester wristbands with inseam zipper. Banjees are the perfect gift for the active folks in your life. Have a runner or hiker in the family? This is the perfect place for them to stash their cash, keys and small essentials when they're out and about! Banjees come in 5 fashionable patterns that also reverse to solid colors. 8. SOL REPUBLIC Deck Wireless Speaker ($199.99) Available in 4 color options. This compact speaker by SOL REPUBLIC brings the sound in a BIG way. The SOL REPUBLIC x Motorola DECK is currently the only wireless speaker on the market featuring Super-Power Wireless Range and Heist Mode (TM) - allowing up to 5 people to control the tunes at once. The Sol Republic Deck Wireless Speaker is the perfect pick for the music enthusiast! 9. Hold-All Strap Case For iPhone 5/5s ($24.95) We have all been there - earphones hanging, knotted, accessories a mess or MIA - it's an annoyance for sure! The Hold - All strap case for the iPhone 5 & 5s allows you to neatly tuck/store your earphones and accessories into the bands for a user friendly experience that won't raise your blood pressure! This handy case comes in 3 fashionable color choices.